Thinking of becoming a Tory? This week someone dug up a Facebook post from October 2012 by a muralist called “Mear One” which shows a mural of a bunch of bearded figures (which he explains as representing Jewish bankers) playing monopoly over a group of huddled human bodies, underneath a pyramid-and-eye symbol (the one that appears on the American Great Seal and on the one-dollar bill). The Facebook post with a picture of the mural has approving comments from Yvonne Ridley and Jeremy Corbyn (who was not considered by anyone a potential party leader at the time); the latter said “you are in good company; Rockerfeller (sic) destroyed Diego Viera’s mural because it includes a picture of Lenin”. Corbyn has claimed, through a spokesperson, that he “was responding to concerns about the removal of public art on the grounds of freedom of speech” but that the mural “was offensive, used antisemitic imagery which has no place in our society, and it is right it was removed”. This does not really chime with the sentiments he expressed in the comment — his first sentence was “why?”, as in “why would they want to remove it?”. I’d not be surprised if his leadership does not survive this, but anyone thinking of defecting to the Tories over this needs to look at their record of supporting and promoting bigotry. His accusations were baseless and in some cases ludicrous — in one case he accused the Muslim community in the UK of attempting to “sacralise whole neighbourhoods, such as Birmingham, by means of marches and processions”, a claim that betrays such obvious ignorance of basic British geography that it beggars belief that it got past the editor. It also has no basis in Muslim doctrine or practice: there is no ritual march of any sort in Islam (the only ritual that involves a procession takes place at the Hajj, which cannot be done in Birmingham), and no such thing as sacralising a neighbourhood. There is a custom of marches to celebrate the birth of the Prophet Muhammad in some sections of the community, but after the march is over, the streets revert to their normal function as thoroughfares for traffic. 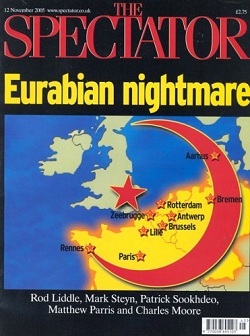 The magazine cover (and with the exception of Matthew Parris, the collection of the most bigoted writers on Islam of that time) followed riots in a number of cities in Europe, mainly in France and triggered by the death in an electricity substation of two boys who had been fleeing the police (who were notorious for harassment of minority youth), though the star was on London (where there had been no riots, albeit an unrelated bomb attack three months earlier) and most of the crescent passed through completely unaffected areas, though this did not stop Islamophobes talking of Muslims lighting a “burning crescent” across Europe. Johnson’s reporting on Islam and terrorism at the time, like the American blogosphere and right-wing media bubble it drew its ideas from, had all the hallmarks of racism; the blaming of the religion and the community in general for the actions of the few, for example, and the fear-mongering about Muslim numbers, the conspiracy theorising, the overstatement of “Muslim power” in which European governments were accused of chasing favour with Arab governments or Muslim minorities (the origin of the ‘Eurabia’ doctrine) when they ‘should’ have been helping the Americans in Iraq. Islamophobia is not Johnson’s only connection with racism, both in his own speeches and writings and as an enabler, as editor of the Spectator. He published an article by Taki Theodoracopoulos which claimed (essentially summarising Charles Murray’s The Bell Curve) that “Orientals … have larger brains and higher IQ scores. Blacks are at the other pole”. Johnson himself wrote that the Queen must love the Commonwealth because it supplies her with regular audiences of “flag-waving piccaninnies” with “watermelon smiles”. So, if anti-Semitism disgusts you then you may be tempted — whether as an MP or as a voter — to defect to a party which has not shown any signs of this particular prejudice for some time but while the Tory party continues to give high office to a man who has openly peddled similar prejudices against other minorities while running the magazine most closely associated with the party, it should not be considered a destination for anti-racist defections. If you can live with both the casual and ingrained types of racism coming from Johnson but anti-Semitism is too much for you, it doesn’t mean you are not racist, it means you are a hypocrite.